Riad Sattouf, the cartoonist and social commentator, has drawn a colorful and engaging first chapter of his three-part autobiography—now in English. The work has pedigree in its original French where it rose to number #1 spot on the French bestseller list and won a host of prizes. The former Charlie Hebdo columnist taps into his childhood talent for capturing personalities within cartoon profiles to paint a fascinating child’s eye view insight into the politics of the time (1978–1984). The central character is his father, Abdul-Razak, who dominates the narrative. He comes across as a forever frustrated and often hypocritical pan-Arab nationalist torn between his European existence and traditional Syrian upbringing as well as grappling with the future of the Arab world and his own family. Abdul-Razak is a man-child, a highly educated academic who rejected Oxford after they spelled his name wrong. He is self-centered and seemingly frozen in nostalgia for his childhood past (suckling up to his mother at times of peril) and a naïve sense of how the Dictators Gaddafi and Assad will deliver a wonderful future, despite all the evidence to the contrary. Riad himself is an angelic blond child whose amazing hair, bequeathed to him by his French mother, means that he is forever out of place whether in a potentially haunted house in the French countryside or living in urban squalor in Libya and Syria. The settings in both Arab countries reflect hope quashed, development stalled, and political systems surviving only through corruption and fear. Time in Syria comes out as a particularly bad chapter in Riad’s childhood. Here children were encouraged to fight in front of their families, school was a brutal and overcrowded bear pit, and animals were casually brutalized with the torture and decapitation of a puppy a particularly savage moment. The book’s child’s eye view sees most characters drawn as extremely ugly (especially taxi drivers) with the visceral smell of sweat and scenes of poverty colorfully told—whether it is children defecating in public or urinating against water fountains, or Riad’s baby brother eating a cockroach nest. Its drawings are drenched not just in the color of the location—France is rainy blue, Libya a pale yellow, and Syria a white red—but also melancholy of political failure, landscapes strewn with rubbish and half built structures. You cannot help but feel the backdrop of failed authoritarianism whose future is known in bitter hindsight by the author. 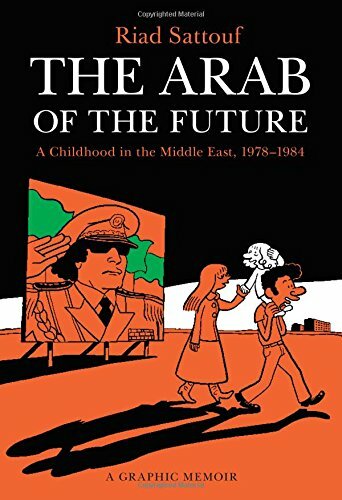 The Arab of the Future maintains a balance of commentary and comedy to keep the reader engaged with prose that is carried by excellent drawings. Riad Sattouf’s work takes its place alongside other classic animated retrospective memoirs from the region, Persepolis, with its tale of revolutionary Iran, and the Oscar nominated story of the Israeli invasion of Lebanon Waltz with Bashir.